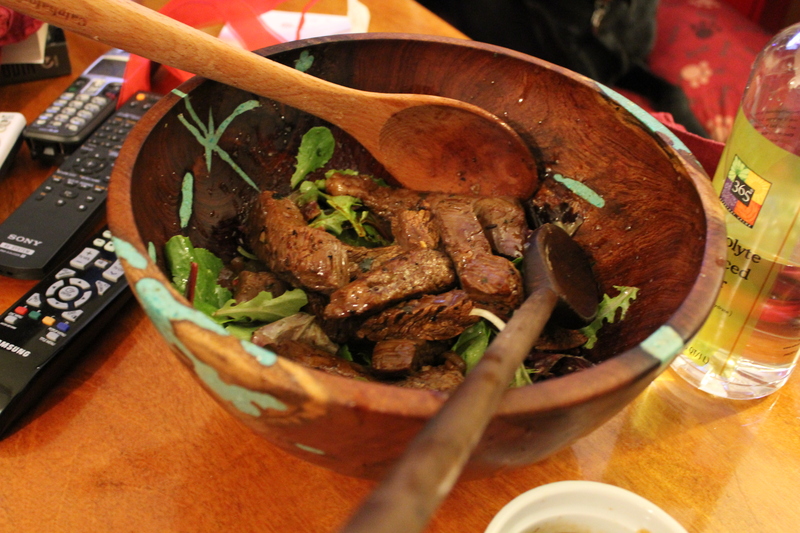 Salade d’onglet was a brilliant recipe; but it totally sounds like salad danglers. I think that’s a euphemism for something sweaty Greek men do in steam-baths. First, it gave me a good excuse to eat steak. If you’ve ever spent time around women – and rumor has it you have – you know that they tend to prefer organically raised cracked Bulgarian spelt salads made out of lettuce that was harvested on the night when its sun-sign was bio-rhythmic with other leafy greens and sprouts-of-other-things-you-don’t-want-to-eat-when-fully-grown. So combining that with a nicely marinated steak is kind of genius. I mean, it’s healthy, right? I actually waited too long to make this, I blanked on the fact that the steak has to marinate for at least three hours, but preferably over night. So I really only had half an hour to marinate it. Even so, it came out very flavorful. One winning takeaway from this dish – a fantastic marinate that packs a ton of flavor. The ginger, the soy sauce and the vinegar all combine to something that’s greater than the sum of its parts. I will keep this in my back pocket for all my meat-marinating needs. And chef – I have needs. Meat needs. Thank you for helping me with my meat needs. Other than that, I know how to make a steak and toss a salad, it’s pretty straightforward. When I go to the market and ask for “onglet” I get a wall-eyed look. (From a man wearing chainmail and carrying a scimitar, so you know, I’m inclined to keep it not-too-surprising with these guys.) But flank steak is very popular around these parts, and I had no problem scoring a pallet-sized side of it at Costco. I used half for this recipe, and the other half is vaccuum-packed and waiting for me now in the freezer, like something wonderful that lurks in a deep, frozen slumber. Like Walt Disney’s head! Walt Disney’s head, on the other hand, wouldn’t be nearly as good with some greens and a nice red wine vinaigrette. And that’s the other takeaway from this recipe – a really nice, simple dressing that packs a lot of flavor into a small volume. Like Kristin Chenoweth. If she were salad dressing, this would be her – sassy, bold and highly concentrated. You can tell her I said that, Chef. You know, if it ever comes up. So thanks for another hit, Chef – this one was easy, was really excellent, and has lots of great ways to be re-purposed for other dishes. Plus, it’s a great excuse to eat MEAT! totally healthy green leafy vegetables!